Peterborough Lions came within a whisker of upsetting National League Division Three high-flyers Hinckley at Bretton Park this afternoon (April 2) while Borough secured their place in Midlands Division Two East (South) for next season. 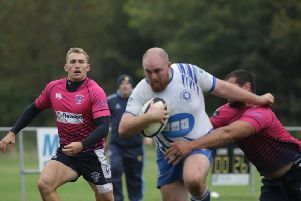 The Lions lost 26-24 to the Leicestershire league leaders, who nicked victory with a last-ditch penalty, while over at Fengate Borough’s relegation fears were finally banished as they beat Belgrave 36-31. Hinckley certainly looked a classy outfit and dominated possession and territory for long spells of the game. But they were never able to shake off a determined Lions side. In fact it was the Lions who held the advantage at 11-8 at the interval - a scoreline that flattered them somewhat. They made only four trips into the Hinckley 22 and scored from three of them. The first two scores were penalties kicked by Will Carrington - one on 21 minutes after decisive breaks by Ben Howerd and Adam Barnard, and the second on 28 minutes after more good work from Howerd, Chris Humphrey and Conor Crown. Hinckley scored a try in the corner in the 36th minute and then on the stroke of half-time Lions’ Lithuanian winger Arturius Balcunius crashed over in the corner after a glorious 40-yard break by skipper Humphrey and splendid support work by Ben Crooks. Hinckley ended the half with a penalty and within six minutes of the restart had forged ahead 18-11 through a converted try and penalty. A long-range penalty by Carrington brought the Lions back into it at 18-14 but Hinckley’s sizzling back play earned them a third try with an hour gone. At 23-14 in their favour it looked like job done. But with time running out the Lions set up a grand finale. First Carrington poked over another long penalty kick and then in the fourth minute of time added on Jack Lewis was on hand to dive over after Kaz Henderson had been felled a yard short. Carrington’s conversion put the Lions within sight of a revenge win - they lost heavily at Hinckley in December - but within seconds a 24-23 lead suddenly became a 26-24 defeat as Hinckley surged upfield, won a penalty and just managed to get the ball over the bar and between the uprights with the last kick of an absorbing contest. Borough were meanwhile celebrating a bonus-point victory over their Leicestershire visitors thanks to a superb second-half showing. Despite taking the lead with a try after two minutes from speedy winger Chris Sansby, they were not at their best in the first half and trailed 19-5 at the turnaround. But in the second half they cut out the errors and upped the tempo. New fly-half Tom Williams began the revival with two touchdowns in quick succession and then Jonno Anderson, Dewi Pearce and Zak McClure went over to make the game safe. Harry Roe converted three of the six tries. Outstanding performances for Borough came from Sansby, McClure, Williams and Pearce while second row Scott Mills grafted his socks off. Borough vice-chairman Archie Bennett said: “We are obviously very pleased to have guaranteed our survival to silence some of our doubters with two games still to play. It’s a good effort considering the amount of injuries we’ve had just lately.